New York! 4:06:14 - Success! Sadly, my last day in New York was a very short one. I allowed myself to sleep in a little bit after the marathon, but since I had to be out of the hotel by 11:00, I could sleep in too much. I think I was up and about by 9:00 - packed and out of the hotel by 10:00. I was a bit sore - the day after is always worse, so I decide to make my way up to the "post race" store they had set up. I thought I'd check out the post race gear for sale, and maybe pick up one final memento. That wasn't to be. After being very impressed with the way the event was run, the two hour line up to get into the post-race store seemed a little ridiculous. So i passed on giving them more money for stuff I didn't really need. Instead, I wandered around Central park for an hour or so. It was a beautiful day - clear, cool and sunny. I really appreciated the fact that the weather was so amazing for the whole trip. The shuttle was due to pick me up at the hotel at 1:00, so I hopped the subway down to the Village, and had lunch at the a little cafe on Bleeker Street. It was an excellent end, to a fantastic trip. One I'll remember for a very long time. The Alice in Wonderland statue in Central Park. 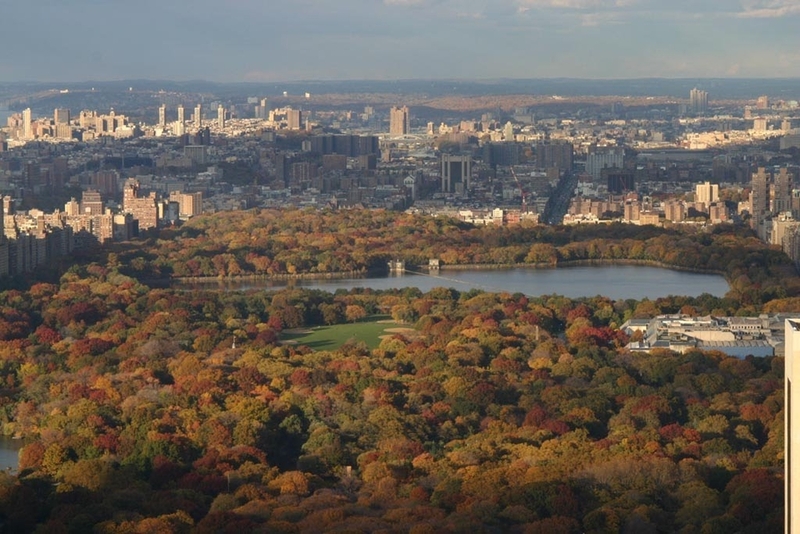 A view of one of the lakes in the Park, with some of the magnificent buildings on the Upper West Side in the background. The start was crazy. Packed with people at the entrance to the bridge. I got goose bumps when the canon was fired at 10:10 to start the race. Then the Air Force plane did the low fly by. Very cool. They started the race with Sinatra's New York, New York, and followed it up with Springsteen's Born to Run. Cheesy, but but got the crowd of runner's pumped and everyone was loud. The crowd going over the first bridge were huge. Down on the river, the fir boats were out, shooting water in tribute to the race. Very cool. Coming off the bridge, it was amazing to see the streams of runners coming off the two levels. Gave you a real sense of the scale of the thing. Brooklyn was long - most of the race. Parts of it seemed really nice, much of it was commercial or industrial. Not a lot there that I remember very clearly. The half way point seemed to take a long time to come. I went out way too fast, and it started to catch up with me on that incline up the bridge, 1/2 way through the race. I started to feel it at about mile 14 or 15. Way too early. The Queensborough Bridge was awesome! First, being confined, it was very load - from the runners themselves! There was one point, near the 1/2 way point of the bridge where it became almost pitch black - no natural light, and there were very few lights. Not sure why, but it was wild - it almost seemed like you were floating through the dark for a few minutes. Very surreal. The "famous" stretch off the bridge into Manhattan was a bit disappointing. You hear so much about that part of the crowd, and how loud they are. But they weren't. Maybe we caught them at a bad time? The guy with the "Running to beat Lance" sign on his back. First Avenue through the Manhattan was very tough. I hit the wall early, and that long, slow up hill run was very hard. The crowds were amazing - 5 or 6 people deep most of the way north. The pride of the people from the Bronx - we got tons of people shouting out "Welcome to the Bronx". Didn't get that in any of the other boroughs. Coming off the last bridge (have I mentioned that I hate bridges?) out of the Bronx and back into Manhattan, someone had set up a huge speaker system, and was blaring out the theme to Rocky. Absolutely hilarious! At this point I got through the wall, and into a bit of a second wind. Coming down Fifth Avenue was cool. It's a beautiful stretch of the city, and the colors from the park, as it came into view was spectacular. Central Park - what can I say? This was why I ran the race. The leg through the Park was beautiful, and the crowds were amazing. Loud, supportive and with you the whole way. It was much tougher than i expected - lots of rolling hills, which I didn't need. The finish line - the last couple of miles I forced myself to run the whole way, including that last .2 miles up that last damn hill. But it was worth it all - all the training, the months without drinking, watching what I ate - it was all worth it. It was an amazing day, one I'll never forget. 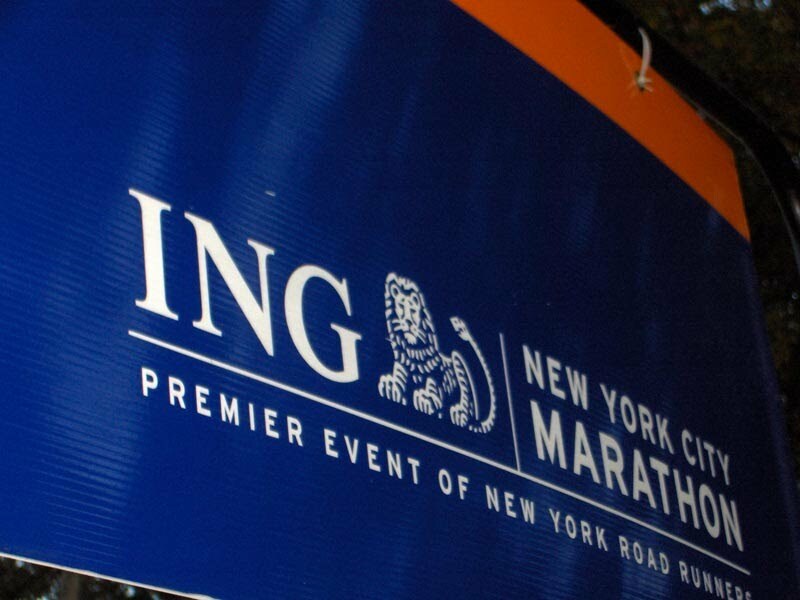 I can now check the New York City Marathon off my life's "to do" list. I got a feel for the magnitude of the race today, at the International Friendship Run. And man is it big. 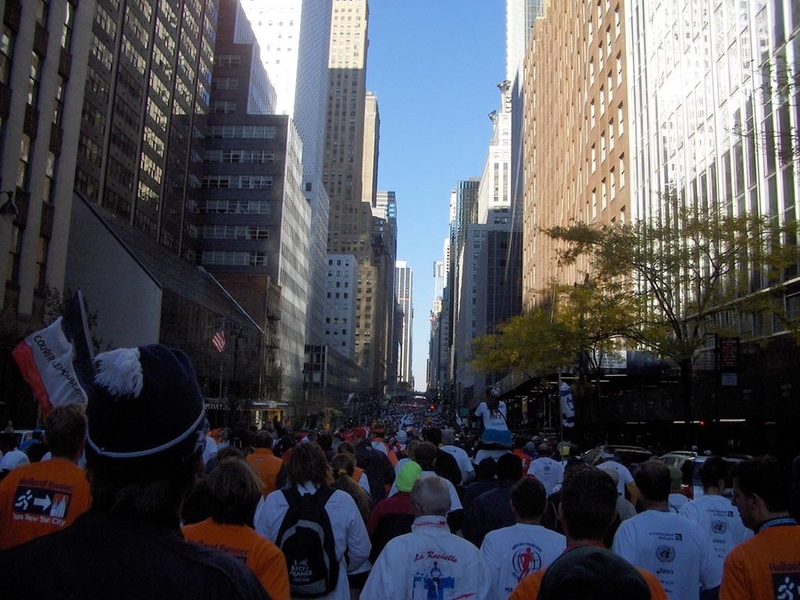 Given the International flavor of the NYC Marathon, they organize a fun run the day before the marathon, for anyone from outside the United States. The stated turnout was expected at 20,000 people, and there were easily that many people at the event. 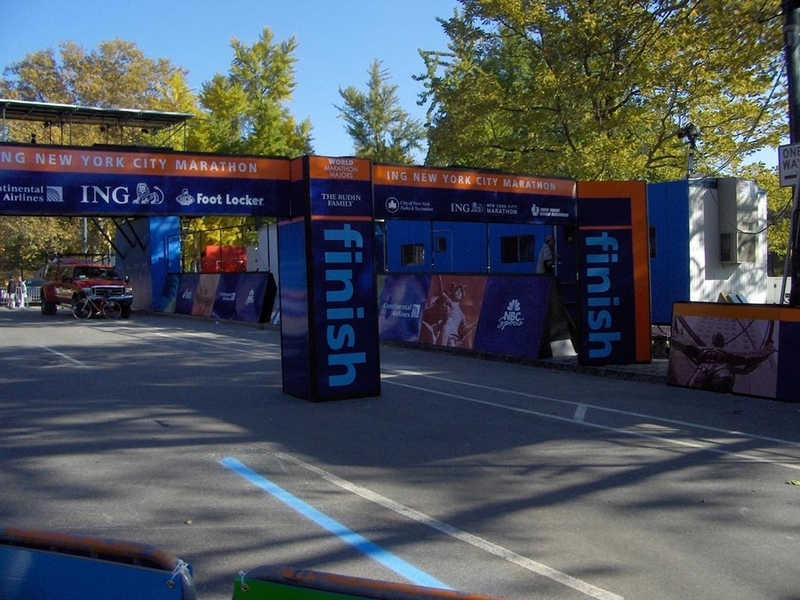 The race is a 6 km run starting that the United Nations headquarters, and finishes at the finish line of the marathon in Central Park, outside Tavern on the Green. It was a beautiful morning - cold and clear. The plaza surrounding the UN Headquarters is beautifully manicured, and has a number of internationally-themed statues, and the trees were all in full fall colours. Most of the time you could barely move faster than a quick walk. It was amazing to see the number of people representing different countries - Canada (of course), Germany, Holland, Ireland, Italy, Sweden, Norway, Denmark, Iceland, Spain, Brazil, Israel - more than I can remember. Many of the had flags, most of them were wearing country-specific shirts or hats. A very cool statue of St. George Slaying the Dragon on the United Nations grounds. It was pretty amazing to watch this sea of people run through the streets of New York - I can only imagine how this will go tomorrow when the numbers swell to almost twice this many. 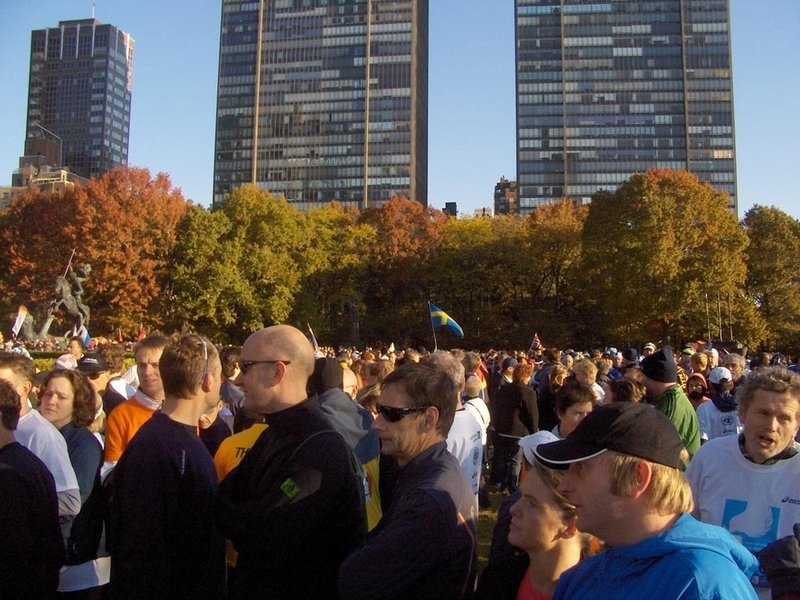 The sea of people at the start of the International Friendship Run. After the run, I made my way back down to the hotel. I spent a bit of time fussing around - getting my things organized for the morning, making sure everything was in place. 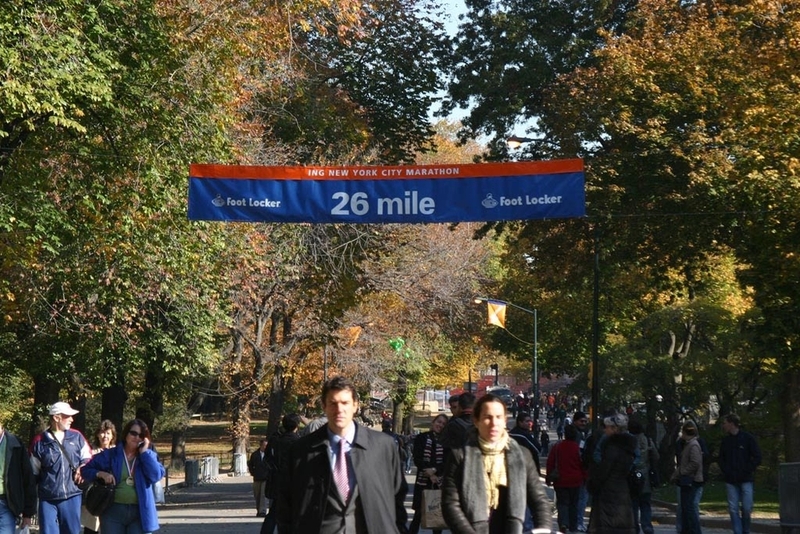 Late in the afternoon, I made my way back up to Central Park for the Marathon Eve pasta dinner. I drew the short straw, and ended up with a 4:30 seating. The route I took lead me through the south end of the park, up the last mile and a half of the race route. it was cool to visualize the finish - even as they were putting up all the signage, and building the finish line and the grandstands. The finish line - the day before the race. I started my day by sleeping in until 9:30, then heading out to check out the race expo. The Expo is held at the Javitts Center, and it's where you pick up your race package, they try and sell you a bunch of overpriced t-shirts, and generally get into the spirit of the event. In trying to keep off my feet as much as possible, I figured I'd take the shuttle over. After waiting for half an hour outside of Madison Square Gardens - where the bus was supposed to come - I got impatient (that will come as a shock to most of you) and walked over to the convention center. The expo was big - not as big as I expected - and very well run. They had things set-up very logically, it was well staffed, and they moved you through very quickly. I think I had my race kit within about 15 minutes. Then I got sucked into the race store. $170 later, I have some mementos to remember the event by. My bib # is 15411 - where they expect me to place in the field, based on my previous race experience. I guess we'll see how accurate they are. After wandering around the expo for an hour or so, I headed out, and back to the hotel. I spent some time going through all the crap (tossing most of it), and setting up my gear for race day. No point needing to deal with that race day morning. After hanging out for a while, I wandered up town a bit. I wanted to do something new, so I went up to the top of Rockefeller Center. They opened a new observation deck on the 67, 69 and 70th floors. It was a nice day, and the views were spectacular. The view north, over Central Park was especially nice. The New York Skyline at sunset. Both pictures taken from the observation deck of the Rockefeller Center. After crashing out for a couple of hours, I met up with my friend Courtney for dinner. Courtney and I used to work together at Absolute, and this was the second time we had been able to catch up during my trips to New York. We had a very fun night - although it was a short evening. I was still pretty tired, and the conventional marathon training wisdom is that the sleep you get two nights before the race is actually the most important one. So we got caught up for a bit, and called it a night early. Nike had the posters up all over town, with this "Run Like..." theme. This bus was the best - pure New York. The ice rink at Rockefeller Center. One day I need to go for a skate there. I hear the line ups are a bit out of control. I arrived in New York this evening after a full day trip from Vancouver. For whatever reason, I ended up with a 3 1/2 hour layover in Chicago, which got delayed for another hour due to weather. It was a long day, and I got to my hotel at about 9:00. The hotel I'm staying at is the 30-30 - a small boutique hotel on East 30th street, at Park Avenue. I stayed here last time I was in New York. It's a decent little place. The view of the Empire State Building from the corner outside of my hotel. After getting settled, I headed out to grab some dinner. I wandered around the neighbourhood a bit, settling on a Vietnamese place at the corner of 3rd and 28th. Didn't realize it until half way through the meal, but it had an awesome view of the Empire State building, which was all lit up with red and yellow lights. Pretty cool. Tomorrow is all about the race expo.